Stephen specializes in orbital, oculoplastic & lacrimal surgery. He also practises general ophthalmology including cataract surgery. Stephen completed his medical school training at the University of Otago in Dunedin and his ophthalmology training in Wellington & Palmerston North. He then travelled to England to a Senior Registrar position in Birmingham, England. His sub-specialist training was a Fellowship at the Manchester Royal Eye Hospital in Orbital, Oculoplastic & Lacrimal Surgery. He was appointed as a Consultant Ophthalmic, Oculoplastic & Orbital Surgeon at Waikato Hospital in 2000. In 2002 he commenced part time private practice at Hamilton Eye Clinic. 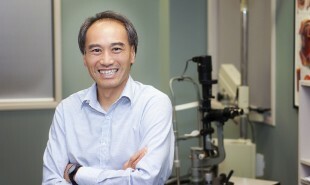 He is actively involved in research into skin cancers around the eye, techniques of eyelid reconstruction, thyroid eye disease and public health demand in ophthalmology. Stephen is married & has three children. When time allows, he enjoys participating with his friends & children in trail running, marathons, half marathons, kayaking races & cycle racing. He also enjoys cultivating native trees & restoring the native bush on his property.